Follow the development of egg to tadpole to frog in these images. 29th June - The tadpoles are now much more like young adult frogs with all four legs clearly visible. The shape of the body is clearly frog-like. They still have tails but these will soon diminish in size and will eventually disappear. 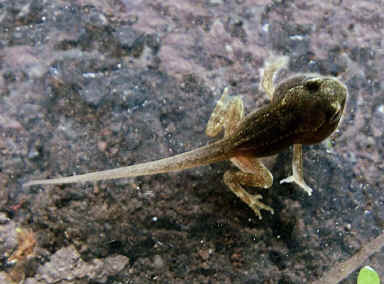 The tadpoles or "froglets" are still living in the water. Note that the front legs hold the body in a more upright position, just like an adult frog.